Stamp with Kathya: New 2016 Catalogs! Happy Tuesday Stampers! Hope the new year is off to a great start for you! So excited for today! Our new 2016 Stampin' Up! 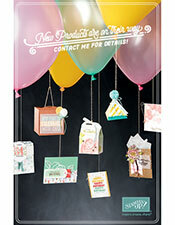 Occasions and Sale-a-Bration catalogs go live today! Meaning you can now order the awesome new stamp sets and accessories from the Occasions Catalog and you can earn FREE products! How cool is that! If you don't currently have a demonstrator that you order from, let me know and I'll send you a catalog. This card features the stamp set Number of Years with the coordinating Large Numbers Framelits Dies. You can get both as a bundle and save 15% off. Did you see the card I made for our blog hop January 1st? This is the same stamp set and framelits I used on that card. Now for the inside of my card, it features the new Party Pop-Up Thinlits Dies. These are so much FUN! They will be a fun addition to your handmade birthday cards! Two different dies come in the package and they are also available in French. I made this card for a good friend who is celebrating her 36th Birthday. I hope she likes it. And this card features two stamp sets only available in the Sale-a-Bration (SAB) catalog. The sweet little chick is from the Honeycomb Happiness set and the sentiments are from Hello set. I paper-pieced the chick with DSP that is only available in the SAB catalog, it's called Perfectly Artistic DSP. The super cute honeycomb embellishments is available in the Occasions catalog. You get 12 embellishments in three different colors. That's all I have for now, I'm happy to be creating again and sharing with you all. Thanks for stopping by today! Until next time.